Please share our FREE content by clicking on the social media icons at the bottom of the article. Too often, athletes focus more of their attention on the field than in the classroom. When college coaches are evaluating high school football players they need two things, a highlight tape and a transcript. They won’t look at one without seeing the other. Do not underestimate the importance of grades during the recruiting process. We have surveyed hundreds of college coaches to understand how grades impact recruitment. Of the coaches we surveyed, 85% told us they are less likely to recruit an athlete with a low GPA even if they can get them admitted. Your grades will also determine what kind of financial package you could receive. Most D1 schools offer full athletic scholarships to most of their athletes, however, the vast majority (85%) of college football players receive either partial or no athletic based aid. Of the non-D1 schools surveyed, 83% indicated that players with a good GPA will pay less for their education compared to those with a lower GPA. It literally pays to be a great student! The graph below, indicates that 94% of D2/NAIA schools say that a good GPA will result in a reduced college bill. This is because D2 and NAIA schools find ways to combine partial athletic scholarships with partial academic scholarships for a full aid package. Furthermore, D3 does not offer any athletic scholarships, so the financial aid package will be based solely on a combination of academic scholarships and financial need. The better your grades are, the less you will pay for school. When do coaches want to see your transcripts? Our data shows that while some D1 schools want to see transcripts as early as the athlete’s sophomore year, all D1 schools and 70% of other schools want to see an athlete’s transcript during his junior year. The same time frame applies for when coaches want to see the athletes highlight tape. It is best to package them together. You can share your recruiting package with over 100 colleges easily by applying to the Verified Watch List. Our data also shows that when high school coaches create prospect sheets, college coaches request both unweighted GPA and Core GPA. Collegiate athletics associations (NCAA/NAIA) set minimum GPA and testing requirements for incoming freshmen. The NCAA sets the rules for Divisions 1 and 2 (you can look at the complete list of requirements by clicking on this link). The NAIA also outlines minimum academic requirements that an incoming freshman must meet (you can look at those here by clicking on the link). While these are the minimum requirements set by the athletic associations, most individual schools have their own requirements. Verified Athletics’ survey found that 80% of schools have their admission requirements set by either the school admission department or the head coach of the football team, not the NCAA/NAIA. Most athletes and families believe that schools have lower admission standards for them versus non-athletes. However, we found that only 14% of schools have lower admissions standards for incoming football athletes. These are primarily elite academic institutions who give their athletic programs more discretion for an athlete that otherwise would not be able to get in. This typically affects athletes in the 3.0-3.5 GPA range. That being said, all schools must adhere to the minimum NCAA/NAIA standards. If an athlete falls below these minimum standards, no school can recruit the athlete, no matter how talented he is. If an athlete is just below a school’s standard, the coach might still recruit the athlete with the hopes that his grades or test scores will go up by the time he officially applies to their school. 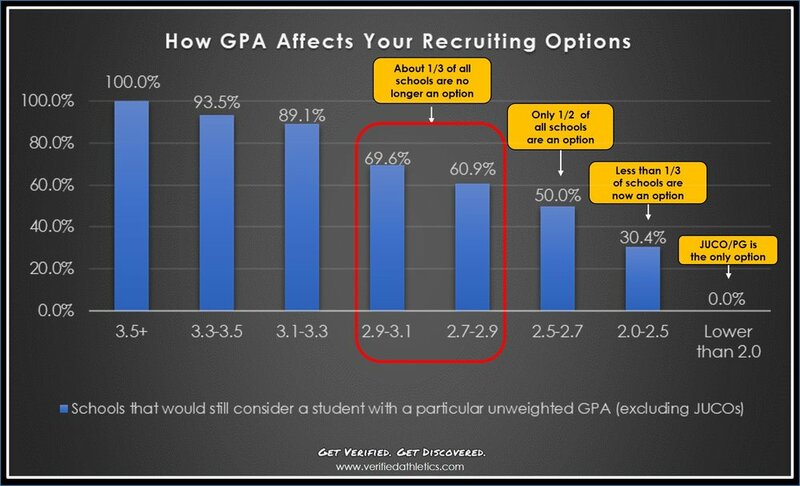 We asked hundreds of coaches at what minimum GPA and SAT (2 part) would still consider recruiting an athlete. We’ve charted these results below to show you how your GPA and scores affect your college options. Our survey data shows that for an athlete with an unweighted GPA below 2.9, the top ⅓ of schools are no longer an option. A student with an unweighted GPA below 2.5 has less than ⅓ of schools left as an option. In fact, for athletes not being recruited by D1 or D2 schools with an unweighted GPA below 2.5, only 14% of D3 schools are still an option. 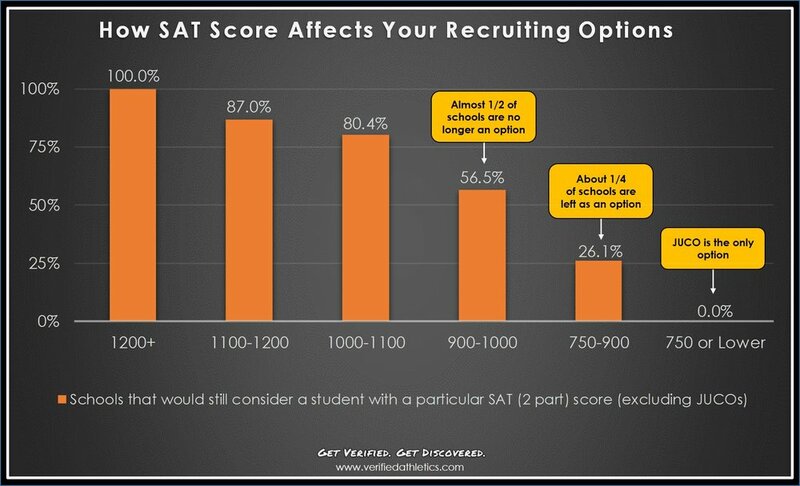 Similarly, when we look at our SAT (2 part) data we see that an athlete with a score between 900 and 1000 loses almost half of the schools as an option. An athlete with a score between 750 and 900 has only ¼ of all schools left as an option. More strikingly, an athlete with a score below 750 loses all of his 4 year school options. Students who are unable to meet the GPA and SAT/ACT thresholds still have an option to play football at the next level. Junior College and Post Graduate schools provide opportunities for athletes with low GPAs or SAT scores. These athletes can apply to a JUCO or a PG school in order to improve their grades and continue to play football. They can then reapply to a 4 year school after meeting qualification requirements. Do not just focus on your athletic skills. Focusing on grades alongside athleticism will give you a far greater chance of playing at the school of your choice. For most athletes, good grades can change their four-year financial aid package by tens or even hundreds of thousands of dollars. Share your transcript with coaches in your junior year. The best way to share a transcript is to apply to the Verified Watch List where you can upload your transcript and it will be available to all the coaches considering recruiting you. If you have a low GPA, focus on improving it as soon as possible, because coaches still might recruit you with the hopes of seeing an improvement before you officially apply to their school. If it is too late to significantly improve your GPA (at the end of your junior year), then focus your attention on doing well on the SAT/ACT. No coach, at any school, can recruit you if you fall below the NCAA/NAIA academic standards, no matter how talented you are. If you do not meet the academic requirements, going to a Junior College or a Prep School are your only options.